NETWORK FINALS: THE PROPOSAL lost 0.1 in final numbers. CABLE HIGHLIGHTS: The limited docuseries REST IN POWER premiered at 0.25 on BET, and 0.20 on Paramount. 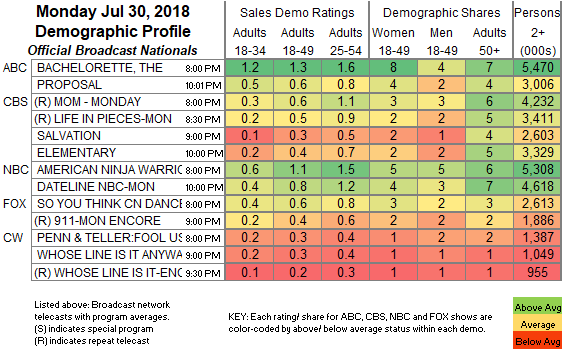 On AMC, DIETLAND’s season finale rose 0.02 to 0.09, and the UNAPOLOGETIC finale was steady at 0.02/69K. USA’s WWE telecast led Monday cable at 1.02/0.98/0.96, compared to last week’s 0.93/0.93/0.91. On VH1, LOVE & HIP-HOP dipped 0.06 to 0.99, and BASKETBALL WIVES returned from a week off at 0.73. On MTV, TEEN MOM gained 0.04 to 0.75, and FLORIBAMA SHORE ticked down to 0.46. On Discovery, STREET OUTLAWS returned from its Shark Week break at 0.73, and DIESEL BROTHERS was at 0.47. Bravo’s REAL HOUSEWIVES OF ORANGE COUNTY ticked up to 0.52, and SOUTHERN CHARM was at 0.17. On History, AMERICAN PICKERS ticked up to 0.33, and BLOOD MONEY premiered at 0.16. On HGTV, LOVE IT OR LIST IT returned at 0.32, HOUSE HUNTERS INTL was steady at 0.29, and HOUSE HUNTERS FAMILY was at 0.29. Nickelodeon’s late afternoon LOUD HOUSE was at #13 at 0.30. MSNBC’s RACHEL MADDOW SHOW led cable news at 0.27/0.42/2.5M, with Fox News’s HANNITY at 0.24/0.43/2.9M, and CNN TONIGHT at 0.22/0.30/1M. TLC’s COUNTING ON was at 0.27. On Food Network, CHOPPED ticked down to 0.26, and RIDICULOUS CAKES was at 0.21/0.18, compared to last week’s 0.19/0.18. Comedy Central’s THE DAILY SHOW hit #19 at 0.26. On ID, THE LAST 24 climbed 0.05 to 0.22, PEOPLE MAGAZINE INVESTIGATES held at 0.20, and THE REAL STORY was down 0.03 to 0.19. 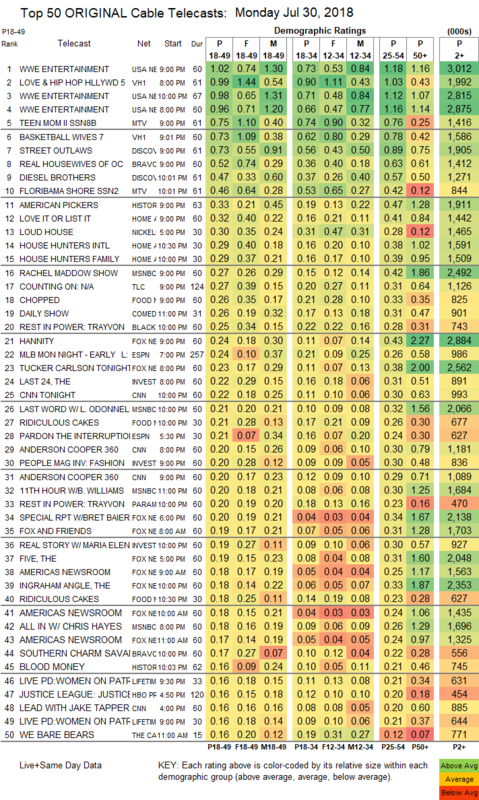 On Lifetime, ESCAPING POLYGAMY ticked down to 0.14.